Delicious Creme Brûlée French Toast recipe that has a tasty caramel coating on one side. 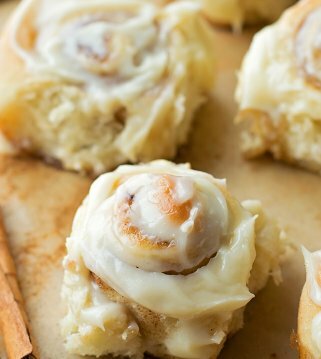 Everyone loves this tasty breakfast treat. 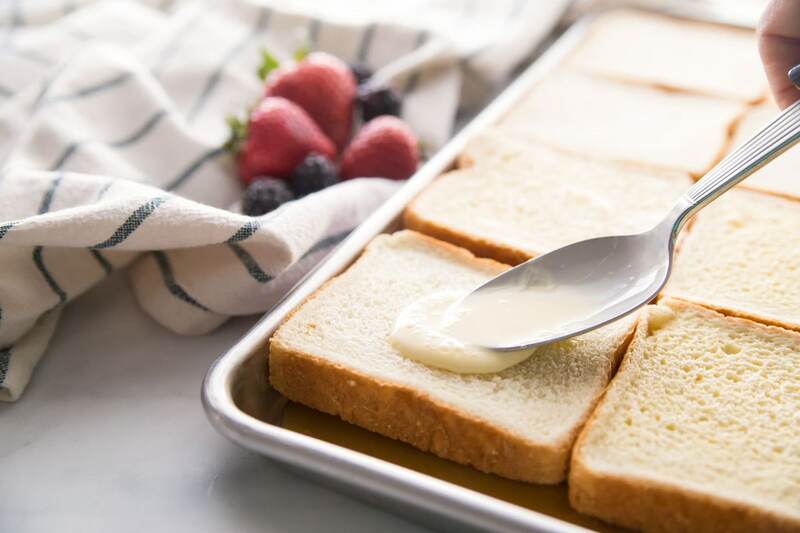 Over the years, we’ve adapted and made several varieties, like French Toast Muffins or French Toast Bake, and today is just another recipe we now love. It’s called Creme Brûlée French Toast. I was first introduced to the recipe when I was asked to make it for a bridal shower. I was excited to try it and was even more excited when it was devoured in seconds. It was a hit at the shower and has now become a hit in our own home. 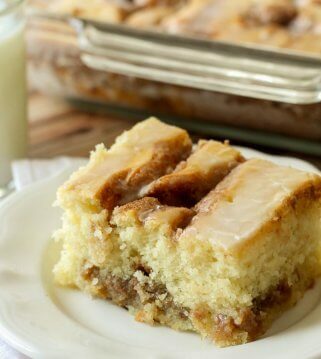 I think it’s hard not to love this sweet recipe because it has a caramel crusted side that is simply addicting. If you love standard French Toast, you love this recipe too! Make your delicious creme brûlée sauce for french toast (it’s like a caramel-y, delicious sauce) in a small pot, by melting butter, brown sugar and corn syrup and mixing until smooth. Pour this mixture into a large jelly roll pan and spread around. Place 12 pieces of bread over mixture to cover pan. Mix eggs, half & half, salt and vanilla in a small bowl. Spoon over bread pieces. Cover and refrigerate overnight (or at least for 3-4 hours). Bake, uncovered, at 350 for 30 minutes. Turn each piece over and serve warm. Using stale or old bread is the best for making French Toast. WHY you ask? Because when using dry bread it really soaks up the egg mixture and the bread will not fall apart. Using soft bread results in soggy slices that will fall apart. Using Aluminum foil will help keep the food moist and cook food evenly. It is great for easy cleanup. I promise any way you serve it, everyone will love it! Can you Freeze Creme Brûlée French Toast? Yes – Make sure to freeze/store individually. Put individual slices in a freezer safe bag. This will help prevent the pieces from sticking together and will make it easier to defrost and heat up to ENJOY. Can you make Creme Brûlée French Toast in the Crock Pot? Yes – After the chilling process – Remove from refrigerator. Cover and cook on low-heat setting for 7-8 hours. Make sure to insert a knife in the center and make sure it is done. This Creme Brûlée french toast recipe is amazing because it has a caramel, crusted side that makes it SO delicious!! It calls for being refrigerated overnight but the last few times I’ve made it, we put in the fridge for a few hours and it still turned out great. This toast still has the egg-y taste you have with regular french toast but substitute the cinnamon for caramel. As with most french toast recipes, it’s simple to make and is great for breakfast OR dinner! 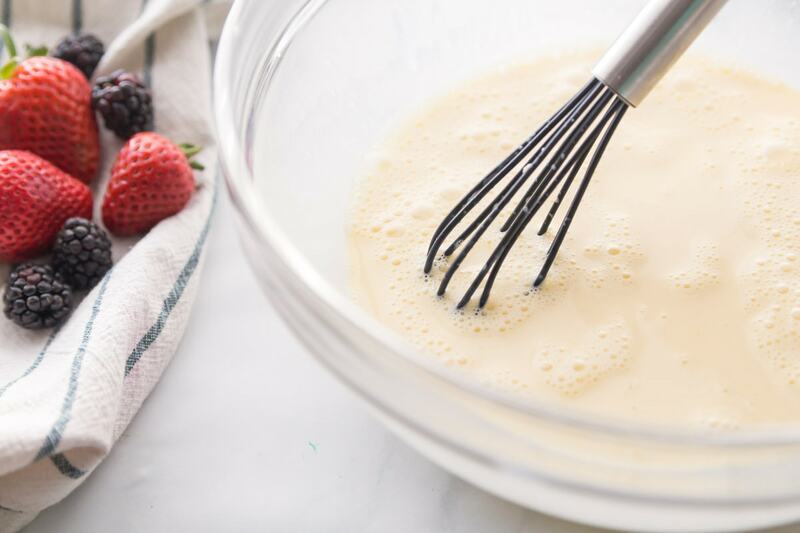 Add some homemade Buttermilk Syrup (recipe found HERE), and you have a very decadent but amazing breakfast recipe that is sure to knock off everyone’s socks! 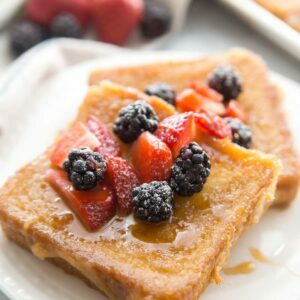 Creme Brulee French Toast - delicious overnight French Toast recipe that has a tasty caramel coating on one side! 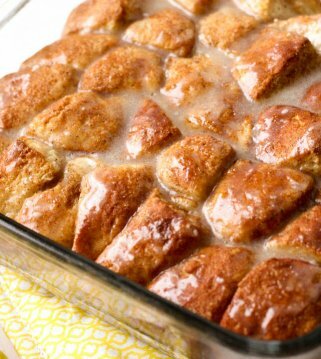 In a small pot, melt butter, brown sugar and corn syrup and mix until smooth. 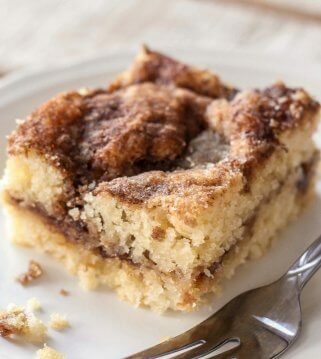 Pour into a large jelly roll pan and spread around. Place 12 pieces of bread over mixture to cover pan. Turn each piece over and serve warm. ENJOY! Kristyn Merkley thanks for delivering this amazing recipe it’s looking so delicious and my mouth watering, I really appreciate to you and your work. Thank you so much! It is mouthwatering for sure! Okay I’m all for creme brulee French toast! This sounds absolutely wonderful, and I love that it’s baked! Well done, Kristyn! I love the caramel taste on this French toast! I had never tried making it like this before, but love changing things up! My family loved it! 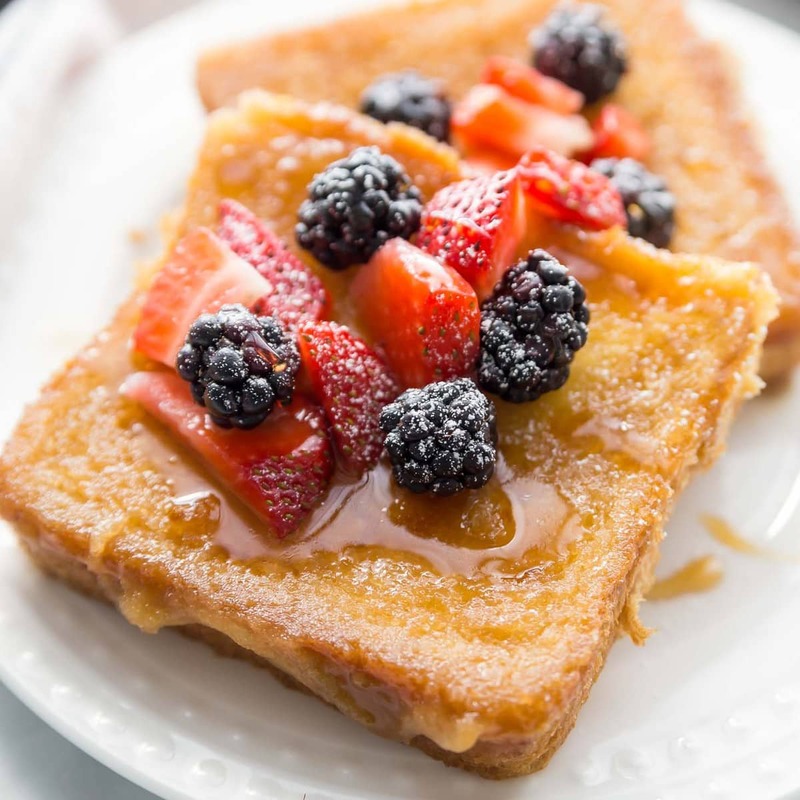 This combines two of my favorite sweet foods – creme brulee and french toast? heck yes! I cant wait to make it! This was such a delicious recipe! It was just as good as leftovers the next day too! 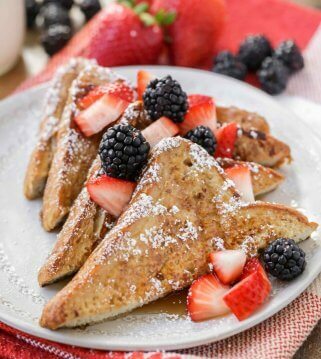 What a great recipe for french toast; my husband will love this! This is like dessert for breakfast! 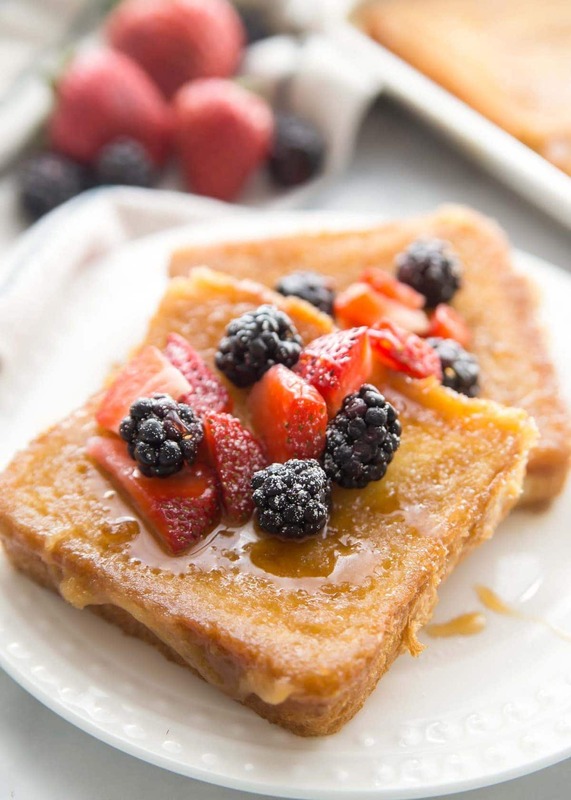 Such a fun twist on classic french toast! Love that added caramel flavor! If You like french toast you will love this! 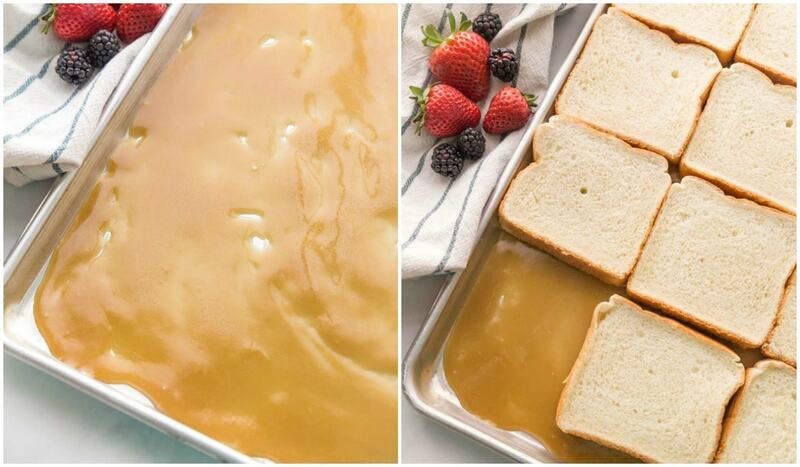 The caramel sauce puts this over the top.easy to make! Im not great at thinking OUTSIDE the box when it comes to cooking so ONE REASON I LOVE YOUR SITE IS BECAUSE of THE DIFFEREnT VARIATIONS YOU MAKE OF The SAme DISH. Thanks for sharing this delicious breakfast!